Manny Pacquiao and Floyd Mayweather Jr. share one trait: both boxers are sick of answering questions about the other. Whenever one has a fight, he's peppered with questions about the other. Pacquiao, in San Francisco Thursday as part of a media tour to promote his Nov. 22 fight for the WBO welterweight title with Chris Algieri in Macau, China, jokingly referenced Mayweather during a telephone interview with Yahoo Sports as, "The one we don't mention." But Pacquiao created a bit of non-Mayweather news on Thursday when he told Yahoo Sports that if he successfully gets past Algieri, he'd consider returning to 140 or 135 pounds. He's been fighting at 147 because it's where the big-name opponents were and because he hoped to make the fight with Mayweather. But given most insiders never expect that bout to happen, Pacquiao said he's willing to go down in weight to seek a big fight. "I could make either weight, 135 or 140, easily," Pacquiao said. "It would be easy for me. I am at 147 because that's where the action is in terms of the opponent, but it wouldn't be hard." The Algieri fight is being fought at a catch weight of 144 pounds, though Pacquiao trainer Freddie Roach said he wished it had been signed for 140. That way, the bout could have been for both Algieri's WBO super lightweight belt as well as for Pacquiao's WBO welterweight title. Pacquiao has weighed 147, 147, 145 and 145, respectively, in his last four outings. He hasn't been below 145 since his Nov. 12, 2011 victory in Las Vegas over Juan Manuel Marquez when he weighed in at 143. Pacquiao hasn't weighed 140 for a fight since he was 138 when he blew out Ricky Hatton on May 2, 2009. "Manny hasn't really carried his power up with him to 147, but he is a very big puncher at 140," Roach said. "It's a much better weight for him, to be honest with you. He would hurt guys at 140." As is typical, Pacquiao will prepare for Algieri with myriad distractions. He's not only a player in the Philippine Basketball Association; this time around, he's also going to coach. That work will also come in addition to his responsibilities in the Filipino congress. Adding coaching to his many duties seems to suggest that he's not taking Algieri seriously, but Pacquiao begs to differ. He was asked how he could give his full attention to coaching his basketball team, which is a full-time job for most people, as well as to his training regimen. Roach said Pacquiao promised he'd miss only one day of training for the fight to deal with basketball. 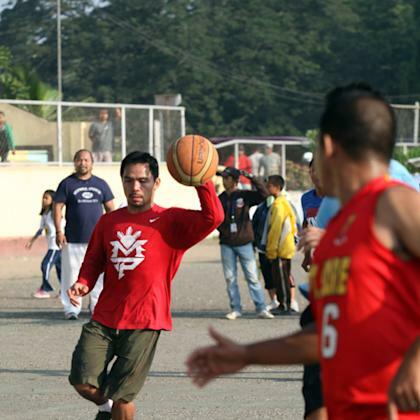 Roach said Pacquiao also agreed that he would quit playing basketball a month before the fight. Pacquiao said he respects Algieri's skills and that coaching his PBA team won't impact his preparation for the fight. "My training is still intense even with all of that," Pacquiao said. "I have a very good assistant coach who will supervise things for me when I can't be there. There are five assistant coaches and so nothing will be overlooked. We can do it all." If he does it all, and is successful, he'll probably drop to 140 for his next outing. Roach said he'd love to see Pacquiao face WBC super lightweight champion Danny "Swift" Garcia. Pacquiao said he would love to fight a big fight at 140 and would be open to taking on the best. He said, "of course, no problem," to potential fights at 140 with Garcia and/or Lucas Matthysse. Roach said he has his sights on Garcia. "Garcia, I think, would be a perfect opponent for Manny," Roach said. "He beat Amir Khan when I had Amir. I know he's a tough guy who comes to fight and he's a quality guy. I'd love a Matthysse fight, too, but I think Garcia would be the one I'd push for if Manny gets past this guy [Algieri]." Pacquiao is a 12-1 favorite at Bovada to defeat Algieri, a skilled boxer who proved his toughness by overcoming two first-round knockdowns in June to defeat hard-hitting Ruslan "Siberian Rocky" Provodnikov. 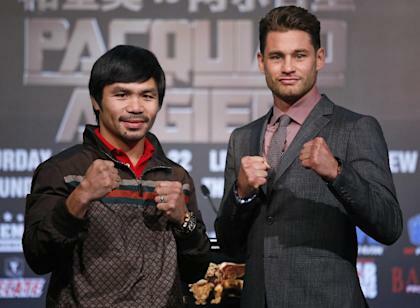 Algieri is the second-tallest opponent Pacquiao has fought. At 5-foot-10, Algieri is only an inch shorter than Antonio Margarito, whom Pacquiao defeated in a super welterweight title bout in 2010. But Pacquiao said Margarito was too big and that is why he never fought again at 154. And it sounds like his days at welterweight may be numbered, also. "Margarito, that fight was a mistake [to compete at that weight]," Pacquiao said. "That's why you never saw me in that class again. I've stayed at welterweight because there have been a lot of fights here for me, but it's definitely no problem at 140 or even at 135. If there is a big fight there, let's do it. It's easy."